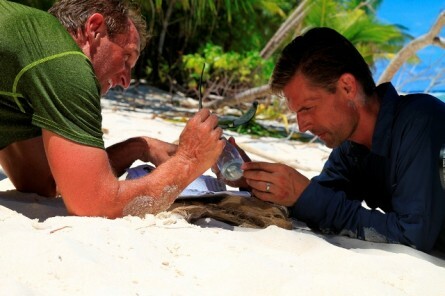 The one-hour episode, which chronicles the political odd couple’s attempts to keep each other alive during a one-week stint on Eru, one of the unforgiving rocks that make up the Marshall Islands, is scheduled to air Oct. 29 at 10 p.m. on the Discovery Channel. According to a Discovery Channel aide, the pols actually pitched the show to the cable network, citing a desire to prove that people in Washington can work together — particularly when push comes to shove. "Both of us know just how frustrated people are with Washington right now. We can both attest that no one is more frustrated than those of us trying to get things done in this environment. We recognize how difficult it can be to cut through the partisanship,” the duo relayed in a joint statement. “So we decided to do something completely out of the ordinary and frankly a little extreme to show the world and our colleagues that even if you have serious differences, if you want to survive you have to work together. " Roughing it in the South Pacific is nothing new to Flake. The avid outdoorsman has intentionally gone all Robinson Crusoe at least twice before, marooning himself on the neighboring island of Jabonwod in August 2009. He brought his sons along in 2013 for some bonding time on Biggarenn. The major differences between those self-styled sabbaticals and this broadcast spectacle were that he got to choose what he needed to survive before (for Rival Survival, Flake and Heinrich had to rely on only three pre-screened tools). Oh yeah, and there’s a whole mess of sharks standing between them and swiftly swimming sustenance. Of course, things could have been worse. The producers, who also put together the harrowing “Naked and Afraid ” series, could have really put the screws to &apos;em. “We’re letting you wear your clothes, so don’t complain,” a show aide said the pols were assured.